Song notes, plus lyrics & chord sheets for 65 cents. Only You Do This To Me. Lyrics: C. Lanches, Music: P. Dunstan, © 01 December 2003. Carol's 3rd song for her Bryan. She permitted me to add my father's voice, the final recording he entered on his mini-cassette dictaphone before becoming too weak to continue his memoirs, a quote so typical of the most interesting father anyone could have wished for, and a wistful yet impish line which fitted lyrics penned in the same vein. Like James Brown. Lyrics & music: P. Dunstan, © 14 February 2004. My turn to mimic the most copied man in popular music history! Whaaeah! Ungghh! Yeeaoow! Runner Up 2007 Song Of The Year Competition, Houston, R&B Category. Winner 2005 Nashville Song Service Competition, First Prize, R&B Category. Lady & Waitress. Lyrics and music: P. Dunstan, © 21 April 2004. For half a dozen of these wonderfully patient ladies. Watching them go about their work with such grace, when I knew what various things they have to contend with in their private lives, brought forth this song, actually as I was driving south from Vancouver to Florida. I practiced it at each rest stop and recorded it on arrival. My first experiment with orchestral mixing. Suggested Artist 2007 (Popular Vote) Song Of The Year Competition, Houston. Had To Lose To Find You. Lyrics: C. Lanches, Music: P. Dunstan, © 21 November 2003. Carols 2nd song for her Bryan. Near My Heart. Lyrics and music: P. Dunstan, © 14 November 2004. For Jen's Ken, the young commercial fisherman and avid surfer who loved the ocean and died in October 2004, as he disembarked at a dock in Canada, of a strange seizure, after just 11 months of marriage. Two people made for each other, of whom their many friends said: now that is true love. Jen had a few specks of his ashes sealed in a heart-shaped gold locket on her necklace. When she showed it to me the song was triggered, the chords a bit reminiscent of Lightfoots style. Freebooter. Lyrics and music: P. Dunstan, © 12 October 2004. For Chris Kelly, sailboat builder of Freebooter Boats, who let me use his workshop precision tools to modify my guitar, the song being prompted as I re-tuned with altered pegs. And for Sir Francis Drake whom my father, also an accomplished boat-builder and sailor, greatly admired. Drake was one of England's best sea captains: master navigator, courageous, and anti-racist long before his time. When his personal friend, a black, was sent to parley under a white flag with the Spanish under siege, one shot him and demanded a "real" emissary. Drake's enraged and ominous demand that the Spanish crucify the offender at the gate themselves or else he would raze the entire city with every inhabitant made the astonished and terrified hearers comply. Otherwise he was merciful and courteous, sparing sea captains he had captured for the gold they carried, dining with them in his cabin before returning them safe to their temporarily hobbled boats (so that they could not pursue him). He was the real "007" of the 16thC, multilingual, defender of the realm in secret and public service, a loose cannon who wrought havoc on the invading Armada. His booty made England solvent to arm against the takeover attempted by King Philip of Spain. Perhaps no mariner ever had more loyal men. Wounded while fleeing to the Panama coast after a raid backfired, he ordered his men to leave him. They would not give up their beloved captain. 20 laid down their lives to get him away safely in the running battle through the jungle. Drake was called "El Draque" (the dragon) by the Spanish, a name still used of him in bedside stories told to their children today. One For You. Lyrics and music: P. Dunstan, © 18 December 2004. A rain dance for Carol, whose 6 poems caused me to pick up the guitar again after a long drought. And with thanks to Cochise, my full-blood Apache friend who lives in Maui, and who taught me many Indian ways of thinking, always with his dry wit. 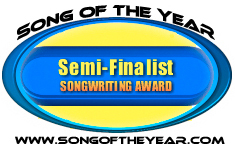 Runner Up 2009 Song Of The Year Competition, Houston, Adult Contemporary Category. Sunshine State. Lyrics and music: P. Dunstan, © 21 February 2005. A light track for all those driving the long road trip south, a journey I have made so many times. The chords are somewhat bossa nova in style and give away the early influence on me of the late and very great Brazilian guitarist Baden Powell, an extraordinary non-conformist, and to whom I dedicate this feathery tune. Gary's Song. Lyrics and music: P. Dunstan, © 07 February 2004. For my landscaper friend, Gary Barker, who gave up driving gas tanker trucks for the simpler life. Overtime. Lyrics: C. Lanches, Music: P. Dunstan, © 18 December 2003. Carols 1st song for her estranged daughter, which could aptly be for anyone in a needless state of separation, offering hope for a better conclusion. Approxeclipse. Music and lyrics: P. Dunstan, © 10 June 2005. An approximate (rough, inexact but fairly accurate) or perhaps proximate (adjacent to, nearby, close) or even proxy (alternative) eclipse (shadow) of the genuine article. The Greek word "apokalypsis" means unveiling, disclosure, revelation. Anyone who has read the Apocalypse of John, or perused the words of the prophets Daniel or Ezekiel will appreciate that when more is unveiled, more also becomes mysterious. And anyone who has experienced a full-scale Floridian tropical storm (quite literally the lightning capital of the world) will understand the analogy used in the music. I wrote this to be a mere glimmer of a handful of the surreal and fantastic images described by those men, and set it to a fairly simple but driving semi-flamenco rhythm to complement the real sound of galloping hooves, which just happened to be at exactly 2 beats per second. Vincent Van Gogh painted an intensely bright portrait of the himself on his way home or on his way to work; the same thing for him since he practically lived in and for his paintings. He obviously felt very upbeat when he created the picture in the midst of all his bouts of frustration and melancholy. The artist carries his knapsack like a playful schoolboy, almost skipping along the country road with colors blazing all around him under the high sun. This is how the image feels to me in music. Everyone has a space they call their own, a place they feel is home, even if it is only in the head or heart.